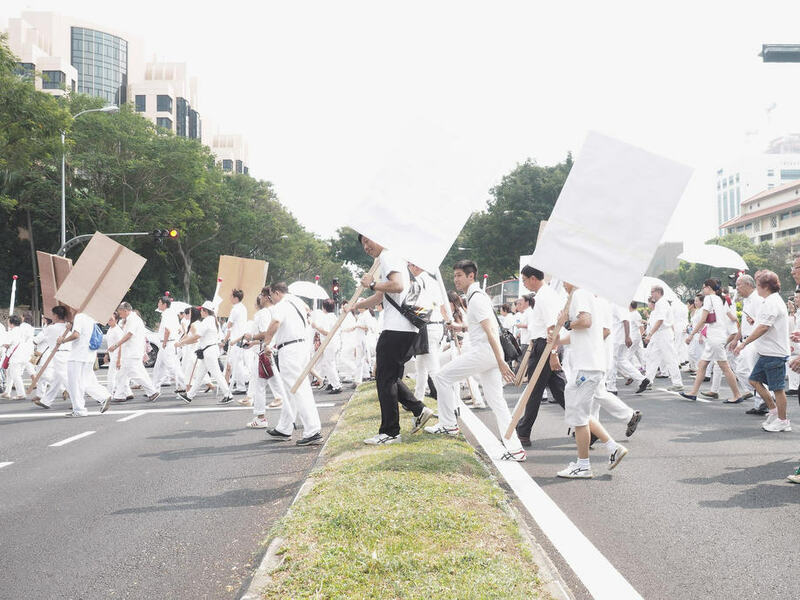 PAP supporters, Singapore General Election 2015. Photograph by Sebastian Song. The rest of the world couldn’t care less about Singapore politics. Election results, as proven time and again, are predictable. The exception might be governments or economists who find favor and model in Singapore’s dominant one-party system. So this #chutpattern piece is really an “ownself check ownself” (borrowing lingo from the 2015 elections) discourse and an existentialist reflection for the Singapore photography community. The Singapore 2015 General Election has just ended with a huge swing towards the ruling PAP Party. Pundits have attributed the swing to a variety of reasons, one of which is the silent ‘supermajority’ and their strong preference for pragmatism. Another points to the many social media images of huge crowds at opposition rallies supporting PAP’s painting of a freak election result. During this election and the one in 2011, it was obvious that the local photography community was compelled and photographers were very active making images. Most might say they were merely documenting events for posterity. Some were guarded about vocalising opinions publicly, a few weren’t. With the function of art as critic and commentary and the role of a photojournalist, a label that many in Singapore find some affinity with, as an objective storyteller (or subjective) and enabler of minority voices, where is Singapore photography today and what role does it play, if any, moving forward? What is our creator psyche – idealist or pragmatist? Do we have an apolitical romance with our country? How does the Singapore photographer negotiate practice with politics in a Uniquely Singapore terrain and climate? Hoping to initiate a discourse, I invited independent Singapore photographers to put down their cameras for pens and contribute personal opinions and perspectives. Those invited were active in one way or another; associate with the label ‘photographer’; vary in age, experience, and perspective; and most importantly, are citizens. I hope the contributions provide an urgent, constructive starting point for discussion, personal or collective, for all who have a vested interest in Singapore Photography and its future. Lest we lose all visible traces of colour. The invitation remains open to other Singapore photographers who wish to contribute. Please add to the comments below or email kevin[at]invisiblephotographer.asia. Opinion Pieces contributed by: Aik Beng Chia, Bernice Wong, Caleb Ming, Charmaine Poh, Chin Hon Chua, Christopher Wong, Darren Soh, Edwin Koo, Geraldine Kang, Lim Weixiang, Megat Ibrahim Mahfuz, Mindy Tan, Nguan, Nurul H.A. Rashid, Seah Yu Hsin, Sim Chi Yin, Sebastian Song, Tay Kay Chin, Weilun Chong, and Zakaria Zainal. “I cannot speak for the rest of the photographic community in Singapore but personally, my stand on the role that my photography plays in the “bigger picture” is really to document our built landscape and the people who reside in that landscape. I do this because change and development is so prevalent in Singapore’s built landscape that we risk losing our shared memories of many of these spaces as we move forward. Even during the General Elections, this doesn’t change for me. As you know, the message I have always been sending out is that the pace at which this development and change is happening is scary, with the rapid demolition of old buildings and spaces and the fabrication of new ones. Politically, I am an equal opportunist when it comes to getting my views on this rapid development heard and I have presented my stand to both people in government as well as the the general populace in the hope that like-minded individuals or groups can then say “yes, perhaps we could think a little more carefully, with perhaps more public consultation before we bulldoze the next old town centre or old HDB estate”. My photographs serve as both evidence and documents of this rapid change, and even from the last GE to this, some rally grounds have disappeared because the open fields that they were held in in 2011 are now new condominiums or construction sites in 2015. Be it a grand state funeral, a 50th anniversary celebration or a general election, I would like to think that my purpose for photographing these events is unwavering. Daniel Goh, a losing candidate of the Workers’ Party who stood in East Coast GRC, may yet get elected to Parliament on the NCMP scheme and to me this is a good thing because his views toward development are aligned to mine (and many other Singaporeans I’m sure). He asked if we really need to constantly build new shopping malls and skyscrapers in this country, a simple question that the government never seems to ask itself. Perhaps it is naive for me to think that with him in parliament, such an inconvenient question can then be considered by all lawmakers. If not, at least we have someone in parliament that has contrarian views to the dominant one that all development is good. “Singapore has become more politically polarised, as evident from GE2011 and GE2015. I would argue that the local photographic community has been polarised to a higher degree, tilting unevenly so towards the Opposition, particularly the Workers’ Party. If you want to slap a pseudo-serious label on it, I would call this “asymmetrical polarisation”. It’s obvious from the photos posted on Facebook that many of the Singaporean photographers flock to the WP/Opposition rallies, continuing the trend that burst on the scene in a big way in 2011. Some say they are neutral, others say they are merely going for the more interesting photos/stories. A few have no qualms about taking an editorial stand and declaring their support for the WP/Opposition. Whatever the explanation, the net effect is not in question: there are far more photos of the WP/Opposition being posted online, and we see more of them because they are shared more readily. To date, I’ve not met one photographer who’s been out covering the PAP in the same way that we’ve seen several photographers cover the WP. I have friends who photograph the PAP as part of work. There are those who make it a point to cover the PAP rallies to achieve some balance in their work. But none of them has said they are photographing the PAP due to shared political values or ideals. The results of GE2015 suggest that Singapore has a silent supermajority. This raises an interesting question for the Singapore photographic community: are we then the vocal minority? The other interesting question to ponder is whether our collective tilt towards the WP/Opposition in anyway shapes or influences how Singaporeans see the election? That seemed to be the case in 2011. I’m tempted to argue that 2011 was a one-off. The social media space has changed significantly since then. It has certainly become more crowded, reducing the chance that the uncoordinated work by a small group of people will dominate the conversation like it once did. “I think photographers in Singapore tend to try to not be political. The visual spectacle of the General Elections draws many to shoot it and given the plethora of new outlets and self-publishing options, we saw more photographers documenting the hustings this year. Some were clearly more focused on the Opposition, though many were careful to balance their coverage with some images of the PAP too. It’s no surprise some were not willing to openly support one side or the other — even if their photography hinted otherwise. Most of us were brought up with the notion of “objective” journalism, as if that were possible. The depoliticisation of Singaporeans over the past two generations extends to photographers, documentarians as well. We live in a society which is not comfortable with taking sides, with advocacy, so naturally people don’t always feel they want to take a public stand. But more broadly speaking, what’s always struck me a bit is that there seems to be little overlap between Singapore’s photographers (and artists) and civil society. When I go back for visits, I have two sets of friends to meet up with – photographers and civil society buddies (from my being active in that scene while still based in Singapore). And it’s always struck me that when I go to events, I don’t see many (or any) at both sets of gatherings. In many other developed societies, photographers, writers, film-makers, artists are quite often at the forefront of civil society, working hand in hand with political activists, NGOs etc. I see that in some of our neighbouring SE Asian countries but less so in Singapore. I sometimes see local filmmakers and playwrights at some of the civil society gatherings and intellectual salons but rarely photographers. It’s an observation my civil society friends in Singapore have made to me over time too: there doesn’t seem to be too much collaboration between photographers and scholars/ researchers, getting depth into the visual documentary work, finding ways to do advocacy campaigns with the imagery etc. “I am disappointed with the general standard of works that surfaced during GE2015. Politics is not just about elections or rallies but many photographers out there making pictures during hustings seem unable to get past the crowd picture. I can’t stop people from posting and sharing and liking. All I could do is to make a statement by doing things my own way. So while it is true that many photographs were made, I won’t say they have made significant contributions to our political climate. Just as many people have said that ‘everyone is a photographer these days’, we seem to have double standard during GE. Do we stop looking at things more discerning just because we believe that photographing politics is dangerous and therefore worth encouraging regardless? Why can’t we expect the real storytellers capable of depth to plough beyond the surface? I spent most of the GE period digesting the issues and talking to different people. That is part of my research process. I didn’t feel bad not making any pictures. I don’t just want to comment or criticize. Rather, I believe that there many more ways I can use photography to benefit the society. “This year’s elections were a well-timed accent in the government’s political script. Called immediately after the celebration of the country’s 50th anniversary of independence from Malaysia, and following a slew of financial incentives bannered under the political marketing of the SG50 brand, Singapore’s general elections form a case study in the effectiveness of shrewd strategy. Nonetheless, in spite of the careful maneuvering of the government, there were brief slices of unpredictability about the direction in which eligible voters would sway. In a country with muted political discourse, the elections opened up the opportunity for opinions to be brought to the fore among the masses. This element of suspense was not lost on Singaporean photographers, many of whom made their way down to rallies every night, faithfully documenting the spectacle. For many young photographers, it would be their maiden chance to photograph anything of such political height. Over the last five years, the feasibility of photography as a mode of communication has culminated in a new generation of photographers who are experiencing a newly found awareness of government and its effect on the national consciousness. Regardless of media affiliation, photography was used as a tool not only to recognise the protagonists and antagonists of the rallying stage, but as a means of obtaining an understanding of the rarely politicised atmosphere that took over the country for nine days. To visualise in person for the first time was one thing; to capture the visual was to set a searing image as national memorial artifact. For me personally, the 2015 elections was the first in which I was present to vote; I had been overseas in 2011, and this year’s elections proved important enough for me that I returned from my travels early, and proceeded to make my way to rallies. In taking photographs, I was interested in capturing a sentiment that seemed hard to grasp: a glimpse of fear, or of hope, or the sheer uncertainty of not knowing where to stand. My images, and the memories of being present at the rallies, were an intimate diary for me both as a photographer and as a citizen. The ease in which photography has been made available also comes hand in hand with the transmission of information via social media, providing an alternative to the visuals of the state-owned media apparatus. Taking into account both photographs made on assignment for alternative news sources such as Mothership.sg and The Online Citizen, as well as independently-made photographs, these images were disseminated with the immediacy that news demands. Blogs, Facebook, and Instagram were all mediums that the public took to for the gathering of accounts and opinions. This meant that in addition to text, the public was able to shape their political opinions through a timely, blow-by-blow visual account. They were also able to obtain narratives that would be otherwise harder to learn of. Edwin Koo’s image of Muslim candidates from the Workers’ Party praying before their rally speech, and Mothership.SG’s series on the early morning rituals of candidates by Lim Weixiang, offer just two examples. The weaving of narratives on a digital platform is significant in providing a more informed, if not livelier, sense of discourse among the masses. “I became aware of politics at a young age, even before I was old enough to vote. In 2011, I became a first time eligible voter in Aljunied GRC (although I turned 21 in 2001) and the only sensible thing to do was to attend the political rallies by the Opposition parties, who seemed poised to bring a different perspective to politics in Singapore and so I did, toting my camera along with me, not knowing what to expect. I, just like many, were curious to see what all the fuss was about. Although I don’t label myself a photojournalist, as a photographer and obeserver, my attention was trained on the people at these rallies. Why were they here? What was so fascinating that so many came out to these things? It struck me that this was a political awakening of sorts but before I got over my awe, GE2011 was a wrap. But I promised myself that when the next one came, I would do my best to do justice in attempting to tell a different side of the story. Fast forward to the present. GE2015 saw me shadowing Workers’ Party candidate Bernard Chen Jiaxi; him being the youngest of the lot of fresh faces, I thought this would be something I could really sink my photographic teeth into. I thought that it would be nice to see images tell the story of a political underdog, a young graduate steeped in grassroots work thrust into the limelight of running for public office. Idealistic? Yes. Naïve? Of course. As a photographer, I noticed many others shooting the elections more as an event and most images barely scratched the surface of who these candidates were and I wanted to do something different, I wanted to see what he saw, experience what he endured and then come home each night to pen down my thoughts and make sense of this very peculiar ritual of ‘winning hearts and minds’. I think as image makers, we owe it to ourselves to delve deeper into the subject we want to explore/expose. We owe it to society to see the biases in mainstream media and counter that with stories we want to see and read about. Being independent, I have that luxury. Personally, I think of it as social commentary because no story published is ever free and clear of the writers’ biased opinion. It is our job as photographers however, to try and depict truthfully, what we see though sometimes it is arguably more challenging because the mere presence of a camera, changes people and how they behave. So really, there isn’t much we can hang on to except, being honest with ourselves. Do I make a photograph to shape opinion and act as advocates or do I take a picture for the sake of taking a picture, to say ‘I was there’? ““Hi Seb, could you write something honest and good?” Kevin asked. After some thought, I decided to be N.I.C.E. Photography is simple. Essentially it is point and shoot exercise. Under scrutiny, it is complicated because of the five Ws and one H. You know, the who, what, where, when, why and how. Fortunately you don’t need a good reason or even one to photograph. Unfortunately, images that resonate are more demanding. The majority of GE2015 images lacks such sophistication. They range from documentary to directional guides which have helped me locate friends amidst crowded rallies. Photography is highly inclusive. Hence we must be careful not to over-intelligent it, conveniently over-labeling images. We owe this democratizing language to be critical. Critical so that photography is not reduced into self-flattering exercises, inflating only our egos and those of our idols. Grand events like National Day celebrations and rallies are perfect lures, drawing the remotely curious to probe. Some refuse to be seduced, claiming moral high ground. “I don’t photograph fireworks just because everyone else is doing so.” But that is not the point. The point of photography is to lend your voice, to interpret your subject forcefully and thoroughly. Your photographs should be forged with ego. The other extreme lies the compulsion to post. To be liked, shared and hailed as a visionary. The seeking of adoration, unfortunately, leaves little room for imagination as the viewer is dished a conventionally acceptable crop of images. Dialogues are ambitious exercises because they recognize diversity. To be diverse, we must be aware. Singapore photography is essentially a middle class phenomenon. Wealth offers opportunities. The access to equipment and literature facilitate the learning process tremendously. Those having to struggle for a living can ill afford to participate and often end up as voiceless subjects. Likewise social media requires access and know-how. I have seen great works that chose not to be shared online. We may have initiated the dialogue but we must not become the alumni. Neglect the unseen and we doom ourselves. “The Only Way to Capture Wayang-ness. During our highly premature 2015 General Election (GE), I decided that I would not go for any of the rallies like I did in 2011. There were plenty of reasons why but the main one being, I did not want to be amidst crowds of people, which I know would be expected in some of the rallies. And so, I sought out images on Facebook. Some of the images however, did not release me of the discomfort of crowds that I had tried to avoid. Nevertheless, I was glad that many photographers were out and about documenting the rallies and people on the ground, as that is what photographers do. In discussing these two huge ideas of the Idealist or Pragmatic, let me start by saying that photography can never be pragmatic as I truly believe that it was never meant to serve that purpose. For if it was, it would not have been made to be placed in the hands of a single individual, seen through one’s eye. And that I feel, is the beauty of photography: that it is a reflection of the photographer’s documentation of her/his instinctual need to capture that which surrounds, one’s own idealistic reality. Had photography been aimed at serving a pragmatic role, it would have been made a large device, a tool in the hands of those in power over a majority, a rather Orwellian reality. Oh wait! There is mainstream media. Let us not forget that they too depict ideals or rather the “pragmatism” of those in power. And essentially, one person’s aim for pragmatism is the destruction of another’s idealism. But what is perhaps more important to note is that, idealism should not be a bad thing. Browsing through the different images of this GE, I could not help but witness a lot of idealism, and this is not just because of the photographers or their photographs. The GE in itself was a handbook in idealism, or rather, wayang-ness. It is a spectacle that can only be documented as a spectacle itself. The role of politicians, especially during the GE is to display, and there are only that many ways one can capture displays. From corridors to display huge masses; up-close shots of contorted faces of those on stage shouting party mandates; amidst the carnivalesque crowds of supporters for lit-up uncles. All photographers come equipped with their own instincts to capture that which is already highly staged. There is thus no way it can be anything other than wayang, and should therefore not be taken as a direct translation of what should be. I do not believe it to be the aim of photographs or photographers to predict trends or polls in the GE. That is not the role of photography and photographers should not aspire to fill that spot either. Photography is a medium and a ‘medium’ derives its creation through another creation. Photography is not about a singular truth but acts as a witness. It is not a dictator but a storyteller who opens up to interpretations. And therefore, to look at the photographs we have of the GE should not be used a determiner of what will happen and neither should photographers aim to play that role, no matter their political stand. “If 2011 was a watershed elections for the opposition, then the reverse is most certainly true for the ruling party in 2015. Since I became more politically aware, I’ve always been keen about issues surrounding the ordinary Singaporeans and the struggles of those whom we’ve left behind as a society. I had opined in 2011 that the challenges faced by the common folk resulted from poor policies and strategy, and the lack of coordination amongst ministries. The PAP were seen as arrogant and their constant refusal to face up to the problems ended with them being handed a sound spanking at the polls. Despite that, they still held 81 of 87 seats despite only obtaining 60.14% of the valid votes. GE 2015 descended upon us. A much mellowed PAP came into the elections to seek a mandate to bring Singapore towards SG100. In the years in between, issues such as cost of living, transportation, social safety nets had begun to be addressed. However, there were people who also felt that the minor tweaks to the system weren’t bold enough to solve the problems in the longer term. It is obvious now that they were the minority. I approached GE2015 with an open mind. I consider myself a middle ground voter, having voted for both the PAP and also the opposition. My roles as a photographer and a voter were fairly distinct. I wanted to hear the long term plans on how the PAP and opposition were going to address structural problems such as population, transportation and social issues such as a widening income gap and help for low-income groups. There were obvious biases though since I’m only human. I chose to focus on SDP, Workers’ Party and PAP as I felt that they had plans more congruent with the direction I felt the society should move, albeit in different ways. At these elections, I decided that I should move away from commenting in the social media space. I didn’t want to be another keyboard warrior. My visual commentary was not meant to convince others. Many were, I suspect, convinced on who they were going to vote for anyway. The Singapore electorate is made up of a large number of disinterested middle ground voters. Their vote appears to revolve around the mood of the general elections. Whilst political apathy has begun to wane, a large number still decide based on current sentiments. It would not be surprising if many have not perused manifestos and listened to speeches to understand what different parties were offering. If their individual lives were safe and secure, they would vote the status quo. Long term plans, structural reforms and such that pose risks but may perhaps bring the country forward together are beyond what this portion of the electorate are ready to deal with. Documentary photography was my conduit for expressing my thoughts at these hustings. There is a saying that it does not mean something is not happening just because you don’t see it. I wanted others to see what I was seeing at rallies and walkabouts through my pictures. I wasn’t fully objective though, even though I yearned to be. The promulgation of fear and municipal issues made the PAP out to be the bully. As a voter, I was more interested in what the parties had to offer. As a photographer, it drove me to focus my documentary on the opposition who had far less resources and are the perennial underdogs. The PAP has all the resources, from the mainstream media to the civil service, to disseminate it’s message. I felt that my photography could contribute to the opposition from that perspective. Being a voter and a documentary photographer with a view to express is an interesting dichotomy, and often a conflicting one. Through walking the grounds with the candidates, I saw first hand how a lot of people are no longer enjoying the fruits of 50 years of nationhood. I saw how many struggle through conversations but I also photographed their hopes and aspirations. It made me feel that the PAP had not lived up to the promise of an inclusive society. It gave meaning to what I was doing and I wanted to convey these messages to a larger audience. Most people don’t often interact with a different strata of society and do not see how the rest are progressing. Concurrently, it made me question if the the candidates with alternative plans could really turn things around. “I do believe the photography scene in Singapore has become much stronger than it was 10 years before. I observed that many people are rather envious about what the quality of work coming out of Singapore. We have come so far together as a country, one built in wealth and prosperity by the one party that started it all. Education has always been a strong suit, culture following strongly behind and gaining grounds over the last two decades. This, I am very thankful for the PAP government for doing. Photography being a time based medium has a very strong mandate in the development of our country’s history then. We often forget that it does not only have immediate gratification but also records for history to be told in time to come. I do hope that we don’t have to wait till SG100 to realise the importance of what we are doing now in 2015. I am happy many photographers are doing their part in documenting Singapore’s political history and urge others to come forward to share their work. “There are several divides (genres) in the photography community, what more when it comes to political views. I often feel ostracised for embracing the term ‘street photography’ and get scorned upon for making photographs in public transport which form a big bulk of my personal work. I have yet to mention how I’m being made fun of when people learn that I photograph weddings too. Similarly, I do not fancy the idea of HDR photography; I guess this is where the divide is. I also have my other struggles like how I’m seen being more active in photography at times, while having a day job as an art director, which requires a separate post to talk about. However, opinions are a rarity these days despite the vast availability and access to social media. Maybe it is more about the lack of constructive comments, discussions, and critiques where photography is concerned. This is true too during this year’s General Election. “Do you have to do this? Are you spying on those who attend rallies? What are you trying to prove with all those photographs you are taking? Those rallies aren’t even relevant to your constituency!” I get these comments from many people who are quick to jump on my open support for the alternative parties upon seeing my General Election photographs (of course there are also good and constructive feedbacks with what I’m photographing). There are many factors but I think being an ex-Malaysian and the political landscape in my country of birth influences my political beliefs in my adoptive country. It is important to have more alternative voices in Parliament. I might be wrong but I think no one will truly believe that photographing the General Election is simply and genuinely out of interest. It is politics. And I think it gets more complicated when mixed with photography. The bias towards the alternative parties is evident in my photographs and perhaps many others. It is probably due to the fact that I’m photographing it from an independent point of view, which is not a bad thing in my opinion. “1) Singapore photography, I believe, is growing and maturing at this stage – moving away slowly from simply being obsessed with gear to becoming a bit more thoughtful. They are learning to discover what to say and how to say it, using their photography. But it is proving difficult, myself included, as more often than not we do not have a questioning spirit. 2) The emergence of Platform as an authoritative platform for discussing Singapore photography has been tremendous in pushing the conversation of photography here. It is also an excellent place to discover new talent and learning about new work. “I photographed GE2015 mainly on assignment for Mothership.Sg. I did mainly portrait pieces initially of WP’s He Ting Ru and PAP’s Ong Ye Kung. On days when I did not have to photograph, I would attend the rallies in my personal capacity. On those occasions I was there to ‘witness’ and although I brought along a camera, I prefered to experience the event and listen to the speeches rather than to photograph. Having been a professional photographer for close to two years now, I am acutely aware that the danger of photography is that we forget to ‘live’ in the moment. Later on in the hustings, my assignments took me on walkabouts with the various MPs from both PAP and WP. A photograph I took of a tender moment involving WP’s Low Thia Khiang for Mothership.sg went viral, which helped me to negotiate increased access to WP candidates and I was able to go into the homes of WP East Coast Candidates Leon Perera and Daniel Goh. Those two photo essays also did very well (close to 4000 shares in total on fb) as it offered a little slice into the lives of these two already popular candidates. The success of the two essays prompted the ruling PAP to offer access to their East Coast candidates as well and I did a similar piece on PAP’s Lee Yi Shyan while another Mothership.SG photographer did one on PAP’s Maliki Osman. So we can see that Photography became a kind of weapon in the quest for votes. “In GE 2011, I was of age to cast my virgin vote. I would say that I was relatively apathetic to politics — the real life issues on the ground mattered to me more than the mudslinging and much hyped-about Opposition rallies. I went for two rallies, and that was it. I casted my vote, and the Opposition in my constituency won five seats in Parliament. “Back in 2011, I was still young and ignorant at the age of 21. I couldn’t vote because my birth date was in August. So I thought, since I can’t vote, why bother so much? Even then, I was still in the army, I kept myself updated everyday from whatever we had inside – the newspapers. Fast forward to 2015, I go down to the ground to experience for myself. During the course of the election, I used photography as a means to understand what it was all about. Politics is a very complicated topic to me. I grew up in an environment where political views and opinions were suppressed. My family seldom talk about politics, least to say when a general election comes. So an opportunity knocked on my door – I got to photograph the national event for an online media, together with a few others. It became a great motivation for me throughout the event. Why? Initially, I wondered if not for this opportunity, I might or might not go down to the ground and photograph and to see for myself. And even if I did, some of the photos might well be uploaded to Instagram or Facebook, get a few ‘Likes’ and that’s all. I won’t have a purpose, a point of view, or any message to impart. So this platform set me thinking on what I wanted to achieve, and then photograph it. First and foremost as a citizen, it was also my first time voting. And coming from the younger generation, it struck me that it was important to understand what elections are about and why I have to vote. So photography became an excuse for me to get to the ground, experience and understand from my own point of view. And this is the part I am worried. Plenty of friends coming from my generation are quite apolitical. They hardly attend the rallies, just plainly listen to what mainstream media portray and what local newspapers report. They don’t go to the ground and peek on what goes on, and eavesdrop what the uncles and aunties were chatting about. Worse yet, some totally don’t follow what currently goes on in the country. I count myself lucky to have photography as a way to pry into something. Another observation I had was about the content of photographs. For example on Instagram, I realized more often than not, photos of the opposition parties especially the Workers’ Party, had more ‘Likes’ than People’s Action Party. It doesn’t matter if the quality of that image was good or bad, as long as the content was regarding Workers’ Party, it would have more ‘likes’ as compared to the rest. And photos of massive crowds too, they garnered more ‘likes’ as compared to other better shot photographs. It has since dawned on me that people in general judge a photograph not by its asthetics, but more of the content. It was an interesting observation to me, why, because the amount of ‘likes’ tend to give a false impression of whether that fellow candidate or political party had better, stronger support. However, it does not represent everything, or the ‘truth’. What you see or think might not be what it is. Of course, the photographs can act as evidence for people who don’t get to go and experience for themselves. They are replicas of scenes that happened, choice of documents of what the image-maker decided to record. In my case, my photos act as proof allowing my friends who couldn’t attend rallies and or have access to places, to know what I saw. “Singaporeans have only just recovered from an outpouring of emotions over Lee Kuan Yew’s death 6 months ago. The collective sadness dug up deep feelings for our island state and then before much of these can be forgotten, we were thrust with the euphoria of the SG50 celebrations, quickly dissipating to a need for choice of new government in the General Elections. What an exciting time you say. And many of us say this emboldened in social media, among our friends, friends of friends, and sometimes we assume, a collective feeling extends to wider social circles. That anticipation of that change must be what many Singaporean photographers were drawn to capture – a generation of 90s, 80s, and 70s-born Singaporean photographers have come up strongly over the last 5 years or so. But it is limiting to attribute their captures to just the GE and the masses at the rallies. It has been a build-up over years, of Singaporeans responding to the events of the nation, major and minor – bull-dozed concrete mosaic dragon playgrounds, empty old HDB flats like Tanglin Halt slated for demolition, increasingly sanitized wet markets, the beloved old National Library on Stamford Road turned road tunnel, the Bidadari graves of our ancestors to be destroyed, the once empty void decks now turned tuition centers, all these architectures of our memories that have been progressively torn down we race against to preserve on paper. And ultimately, it is these things – the masses of people making the effort to come to the rallies after a hard day’s work, those who believe their voices would be heard, those who have come with an open mind, that I struggle to photograph whilst trying to keep my version of Singapore alive. I felt a great social responsibility to come forward in immortalizing such visual representation. Although I was at more opposition rallies than PAP rallies, or you can also say that I divided my time equally between each of the 4 political parties I chose to photograph. It is with a gentle heart I go to photograph the people’s emotions, or the none of it, and I am neither left or right winged in my purpose. A shot of a cheering man shows a split-second of emotional truth. A shot of a ma standing still listening hints at interpreted truths – the thoughts on his mind, the weary that belies his face, his expressions of strength and hopefulness. Scenes of people standing in pyjamas along common corridors listening to rallies, to the toilet cleaner raising his hand, in tears. What the photographer places in his frame, coupled with a deep understanding of the local context has the power to highlight hidden anecdotes of reality. Together, the ordinary and emotional collective of images enable the reader to piece together a story, or interpret an emotion the photographer felt at that point. For me, my intent stops there. Perhaps my photographs call out for a society my heart seeks – a kind of world more equal than divided, where wealth disparities are smaller, where progress means no one gets left behind, and all of us can move up together as one nation. I want back my snippets of home, of childhood, not more new shiny things, tired faces or super trees. Observing a week long of rallies, I saw that a segment of our society want change: fellow Singaporeans who are struggling, some who are only just beginning to explore for themselves what Singapore politics is all about. “There exists, then, an absolute contingency between a limit and a transgression; they are unthinkable, meaningless and futile in isolation. The meaning derives from the moment of intersection between these two elements and from all that follows in the wake of this intersection. There is an inevitable violence in the collision and a celebration in the instantaneous moment at which both limit and transgression fuse in meaning. Limit finds meaning through the utter fragility of its having been exposed, and transgression finds meaning through the revelation of its imminent exhaustion. This is an orgasmic juxtaposition. But equally clearly the power and energy of both elements derives from the perpetual threat of constraint or destruction presented by the other. About a month ago I was relieved to finally have been asked, at point blank, about what my practice really does. Her gesture, though genuinely curious and non-antagonistic, registered to me as a more deep-seated anxiety and frustration towards the nature of conversations and actions that follow politically engaged artistic and image production. Aside from negotiating angst, what exactly do our works resist or hope to achieve? Worded more cynically, do our efforts ever, or need to, go beyond ourselves and our immediate safe spaces? These questions arise from acknowledging that my practice thus far has been rather self-serving, even when involving others. They are also informed by my experiences of the art world, or more specifically, understanding the nuances of art-world-politics. What I struggle to articulate are the complexities that arise between creators and their images; they are never one, and therefore both exist in different systems of relations, and therefore politics. More complications may form when the two overlap. I grapple with photography’s stagnation as a medium, or what to me looks like a plateauing. The camera has become near-ubiquitous; serious practitioner or not, I am overwhelmed and bored with the multitude and speed at which images are produced, and usually in similar fashions, for the same purposes; I can only blame technology so much. But I also recognise my impatience, and the possibility that I am projecting my own relationship with photography onto others. This GE, I became formally aware that I don’t have the need to chase history-in-the-making with my lens, and I remain skeptical (sometimes indifferent) when big terms like ‘preserving social memory’ and ‘images for posterity’ are used (as if these in themselves are objective goals); a more appropriate discussion of this would be to dig through the politics of archives. At this point, I need to distinguish between ‘documentarian’ photographs that circulate in official public press from those running on private social media threads and alternative reportage. What platforms photographers straddle (or don’t) reflect their proximity to what they photograph. Despite photography’s currency and power to affect, it remains passive until activated by language. Any kind of political positioning from individual practitioners comes from the words they and others use that represent this affect, which is further perpetuated through larger technologies, systems and paradigms. To truly look at our work objectively is to understand that it has no inherent meaning until we or someone decides that it does. We see what we want through the lens, and more so when we put it down. Where that places us, I’m not so sure. Post-LKY GE2015 offered a faint promise of change in the air in spite of the haze: full contestation of wards, cross-party dialogues, fair(er) reporting and bursting streams of online conversation. This would be the start of a new leadership for Singapore — one where smaller and different voices would be given room to echo, paving the way for a more politically diverse, conscious and articulate environment overall. Photographers once again worked the grounds of rallies, documenting the throngs of onlookers surrounding the stage, watching and waiting through candidate after candidate. An occupancy of space we see only once every 5 years, the sheer physical energy felt at rallies is undeniable even if you can’t look past the theatrics. Needless to say, I remained as distant from the action as I have always been. Rather than glimpse at my future MPs in person or soak up the static, I sifted through commentaries and manifesto videos, occasionally sharing anxieties with close and like-minded ‘liberal’ friends. I didn’t even pay that much attention to photographs of campaigning ministers and rally nights. After the results were disclosed, we finally resigned to the fact that we are the sheer minority, even amongst those who know nothing about economic and foreign policy. Our voice had seemed significant only because we were preaching to our own public; social media simply did not account for the larger, silent opinion that took us by storm and surprise. (I then, of course, had to root for Tharman Shanmugaratnam as Prime Minister.) After having my naiveté checked with freak results, I learnt to understand that the porousness or elasticity of a threshold is not necessarily an indication of its flexibility. On the heels of Geraldine Kang’s thoughtful write-up, I offer up my take. So responding to Kevin’s initiative on “Photography, Politics and Pragmatism”, I can only comment on practice. And my starting point is the many GE2015 photographs taken during the nine-day run-up to polling day. Some beautiful portraits and street scenes. But … you’re not going to like what I say here. And I challenge you to disagree with me and to pick that ONE image that reflects your view or even better, do a follow-up project to hone your point of view and start a discussion. Because the photographer’s point of view was sorely lacking. I now have the benefit of post-election discussions namely Maruah’s Post-elections forum – What’s at Stake? The surprise there was this: Terry Su (editor of The Online Citizen) actually agreed with longtime political analyst Derek da Cunha that social media had NO impact on the elections. Forget rhetoric, whatever was posted didn’t sway or move or got enough people angry. Now why is that? What happened? For whom did you make those photographs? Do you as photographer NOT have an opinion or did you choose NOT to say or didn’t have time to say? Or is it that photographs (in addressing the political) that capture a point in time don’t really matter but a series taken over time, thoughtfully edited and written up, does? Are Singapore photographers taking “political photographs” more like fashion photographers, just capture this season’s look and broadcast? Which means what is today’s front-page photograph is tomorrow’s garbage-can liner. Worse … I think you (photographers) allow the GE2015 photographs to talk rubbish, even lie. You allowed the photograph to show what is seen but not what questions one needs to ponder such that you just freely allowed a viewer’s mind to be corrupted and make up wrong assumptions. Whereas there were tactile, contextual aspects of your experience and practice that you withheld from sharing. The massive crowds of opposition rallies that you showed were real but you often made them look like Tahrir Square, like opposition was formidable. You forgot or were not aware or didn’t pay attention to what some of us voters really needed to know, which is that we couldn’t tell one opposition party from other and they should not all be lumped together as “the opposition”. We are risk averse; you knew that, did you not? Just what help were you to me as a voter? What thinking did you debunk? Figuring out photographs including GE2015’s is hard work for a viewer like me. My basis for this comment is Ariella Azoulay’s The Civil Contract of Photography, in which she advocates “the duty” of the viewer to act as a member inhabiting the same ecology as the subject, the issue, the photographer, the camera and the frame. Importantly, she binds this contract to equal voice, seemingly undetectable, to counter “the sovereign” usurping dominance and “making disappear the violation of citizenship”. As such, the inherent power play in photography assumes that the photograph itself is mute. The voice that speaks and acts on its behalf is the gaze that counts. The point is photographs have to prompt the viewer to speak. In a way, many photographs I saw were works of photojournalism that capture a moment in time but sadly not of the highest caliber because there was not enough critical commentary. The few instances that I got around to hearing about the photographing sessions … the practice … were much more interesting: e.g. how the opposition rallies differ from GE2011 (from Derek da Cunha: deliberate early arrival at major rally to see how crowds assemble, noted more empty spaces in GE2015 opposition rallies – what does that mean? From Kevin Lee: how loud and raucous crowds were in GE2011, why more subdued this time?) and Megat Ibrahim Mahfuz shadowing WP’s Bernard Chen told me about the surreal one-room HDBs where Singaporeans live cut-off from light and outside world, prompting the questions: who cares, who cares for them? All these conversation fragments lead to “so how do I vote and why”? What do I as a voter need to think about; the photographs didn’t push me to thinking what is my voice on behalf of the photographs, what is my civil contract with the photographs? It becomes a case of when I can’t figure out amidst the confusion, I vote for the least confusing (which I didn’t). I believe in the power of text, the artist’s writings. One great example is Allan Sekula’s exhibition, Fish Story, to be continued (at NTU CCA Singapore till 27th Sept) where Sekula’s practice is not his photographs or film which were actually quite plain, but the questions he raised through his writings on globalisation and capitalism, his vantage point on “critical realism in contemporary art, representation of labor as well as the vast topic of the sea”. Even titling of photographs speak volumes for me as in Thai photographer Manit Sriwanichpoom’s Waiting for the King series 2006, so much is said in the subjects’ faces and the title (http://www.rama9art.org/manit_s/waiting.html). Lastly, referencing Tharman’s high votes, he won on his power to strategize and visualize scenarios. All that said, there is still much to fuss over in Singapore and great opportunities for photography. Especially now, as someone said, “the new normal is dead”, so are we in new “old normal”? It’s complicated. And Singapore photographers need to get more complicated, more strategic-minded and more provocative. Can’t just run around snapping stuff; otherwise, I agree with Sebastian Song’s write-up: it only turns out to be “nice”. Pragmatic but not political. Thanks everyone for contributing. All opinion pieces have been published as submitted, a few with minor grammatical edits.